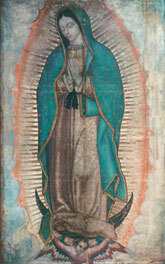 Today, December 12, is the Feast of the Virgin of Guadalupe. Blessed Virgin of Guadalupe, Mother of the true God for whom we live, bearer of Jesus Christ who gives us His Spirit and gives life to the Church. We thank you because you are our loving and compassionate Mother; because you hear our weeping, our sorrow; because you are the remedy and the cure for our grief, our misery and our pain. Thank you Mother for placing us in your heart, for allowing us to be under your shadow and your protection, for being the source of our joy and for keeping us in the hollow of your robe and the crossing of your arms. Thank you Our Mother because we have learned this message through your humble son St. Juan Diego and through his intercession we ask that you fortify us in Peace, in Unity and in Love. Amen. Thank you Virgin of Guadalupe for your protection and clarity yesterday and today for a long standing problem that has finally been resolved. Guide and protect me and keep me on the path of your holy instruction. I thank you for your appearance at the bends in the path of my life….the way is lit.